The holy city of Varanasi, also called Benares or Kashi and one of the most sacred cities in Hinduism, is located on the banks of the Ganges in the state of Uttar Pradesh, about 800 km east of the Indian capital Delhi. Varanasi is ideal for adventure and study tours, which can also be combined with yoga and meditation or with the worthwhile Buddhist pilgrimage sites in the surrounding area and in the neighboring state of Bihar. Varanasi is regarded as the place of Lord Shiva, who is worshiped in many temples and shrines here under the name Vishvanath. The city forms the center of the Hindu faith and has, from time immemorial, attracted and captivated pilgrims, spiritual seekers, sannyasins and saints, including many spiritual greats such as Buddha, Mahavira (the founder of Jainism) and the Hindu reformer Shankaracharya. With its large array of temples, villas and palaces dating from the 18th and 19th century, rising in several tiers from the banks of the Ganges, Varanasi is one of India’s most picturesque cities. Particularly noteworthy are the Ghats, which are high and wide flights of stairs, stretching for miles, leading from the buildings down to the river bank. Each Ghat has a special significance and takes its specific place in the sacred geography of the city. 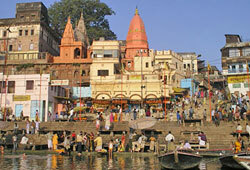 The religious rituals are concentrated at the Dasvamedha and Manikarnika Ghat. Life and death go hand in hand at the Ganges. Every day, thousands of pilgrims gather at the Ghats to take their ritual bath in the river, to rid them of their sins, while only a few meters away the bodies of the dead are being burned. To die, above all places, in Varanasi and be burned at one of the many cremation sites there is something many Hindus wish for, as this should release them from the cycle of rebirth. The ashes are subsequently scattered in the river. Since the 6th century BC, Varanasi has been a center of Hindu culture and science, a center of learning for Sanskrit as well as music and dance. For travelers, this city, with its more than 200 important Hindu, Buddhist and Jain temples, represents an ideal place in which to develop a deeper insight into the millennia-old cultural traditions of India. No other place offers an atmosphere as timeless and steeped in religious and spiritual values. The city itself is a fascinating image of a cosmic mandala, gradually revealing itself to visitors through expert guidance. The famous atmosphere of the Ganges at dawn is best experienced from a rented rowboat. The first rays of sunlight bathe the grandiose backdrop of the city in soft colors, while flower garlands and flickering oil lamps in clay bowls float on the water, the river resounding with devotional sounds emanating from the temples and pilgrims taking their morning bath, cupping the water from the Ganges in their clasped hands. The area around Varanasi is also known as the birthplace of Buddhism and formed, over a long period of time, the center of the Buddhist world. Important Buddhist pilgrimage destinations nearby are Sarnath, located ten kilometers to the north, and in the neighboring state of Bihar, the cities of Bodhgaya, Rajgir and Nalanda.